If ever there was a myth about wine, it is that it pairs great with cheese. When was the last time you ever thought about adding a little wine to your milk? Doesn't sound too appetizing does it? So where did the idea of wine and cheese come from? My guess is that local cheese producers wanted to take advantage of the regional wines that were being produced. I still believe that if you have a wine from an area that produces cheese, try that cheese with the wine (they come from similar terroir). Wine and Cheese pairings are one of those "tricky" things to work with. Check my series of articles about wine pairing at Wine Pairing Part One, Part Two, Part Three, and Part Four. There are so many cheeses, there is no way to cover them all, but let's consider the types of cheeses. There are fresh, soft, semi-soft, hard, and blue cheeses. On top of that, cheese can be made from cow's, goat's, or sheep's milk - each imparting different flavor profiles. In general, when pairing cheese with wine, think the lighter/ fresher the cheese.. go with crisp, fruitier wine. Semi soft cheeses move up in weight, as well as mouth coating creaminess, so think acid, but with weight and fruit (this can range from a fruity Sauvignon Blanc to a full bodied Pinot Noir, and everything in between). Hard cheeses tend to be aged longer, and have more distinct flavors. A "rule" to follow here would be, "the stronger the flavor, the bigger the wine" (Merlot to Zinfandel and Cabernet Sauvignon). Among the cheeses often associated with red wine pairing are blues such as blue cheese and creamy cheeses such as Camembert. However, the creaminess of the cheese is drowned out by the dryness of the tannin in the reds. Blue Cheese can range from mild to strong. Remember to match salt with sweet, so the salter the cheese, the sweeter the wine. 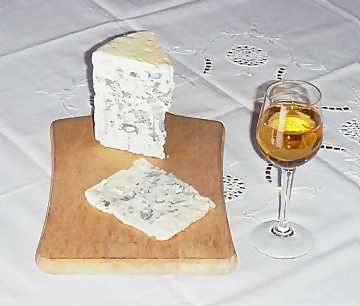 Sweeter styles of white wine such as Sauternes pair best with blue cheese such as Roquefort, as the drink enhances its saltiness. The acidity of German Riesling offers a nice contrast to the tangy nuttiness of a Parmigiano-reggiano, while the grassy, mineral flavors of French Sauvignon Blanc can also deliver beautiful flavors when paired with goats’ cheese. But the bolder, more tropical flavors of Sauvignon Blanc from New Zealand tend to be too strong for this effect. Whites which have been “oaked”, left in oak barrels to absorb the wood’s flavor, should generally be avoided with cheese. Look for those fermented in stainless steel. If you must pair a red wine with your cheese course, invest in an older wine, such as a traditional Rioja at least five years old, as time will have softened the tannins. But it will still need to be served with a strong cheese such as cheddar, or (my favorite) Manchego. 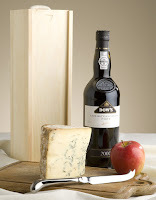 Port and Stilton are a classic pairing, but instead of the ruby ports, try a lighter tawny Port. As mentioned, Sauterne with Roquefort is a classic wine and cheese pairing. You may want to even try a Brandy with cheese. We had experimented with Calvados (Apple Brandy) and found that it worked wonderfully with Camembert covered with sauteed onion and apple. Remember that when you are pairing wine and cheese together, first taste the wine by itself. Next taste the cheese, and sip the wine with the cheese....wine, cheese, wine. Your cheeses should be arranged from mildest to strongest, to help keep your palate from being overloaded. Softer cheese before hard cheese, and cow's milk (the mildest) to Goat, then Sheep and finally Blue Cheeses. 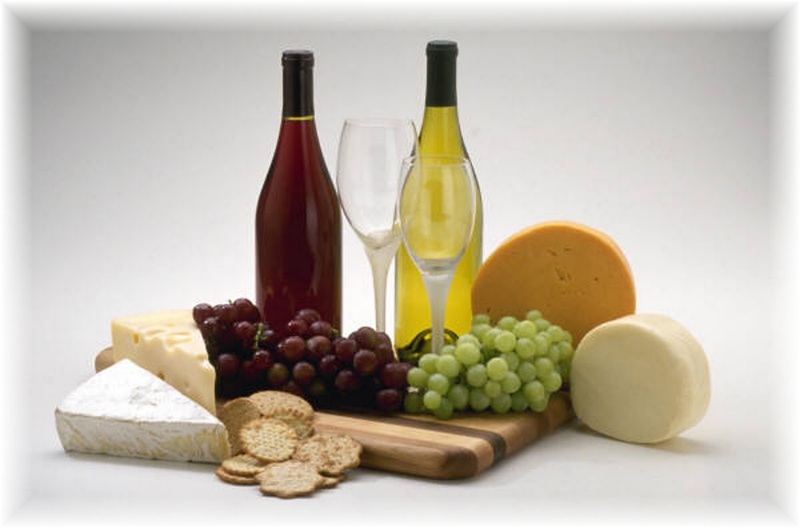 The cheese will influence the taste of the wine, more than the wine will influence the cheese. Don't "waste" your best bottle of wine with a cheese pairing. Another little "trick" with your wine and cheese pairing, is to have some palate cleansers served with the cheese. Water crackers are a nice addition. I have also found that almond nugget and quince paste make a nice addition to a cheese plate. Twas the week before Christmas, and what should we do? the malls were too crowded, so let's make some stew! They were given a recipe that got them excited. after cooking a while, we were ready to dine. Okay, that is about as far as I can get, with the Christmas theme, but you get the idea. We decided to get a group together for a Spanish wine pairing dinner The idea was to start with the wines, and pair a meal around those Spanish wines. The wines were to progress from a Cava to a white, to red, to dessert. 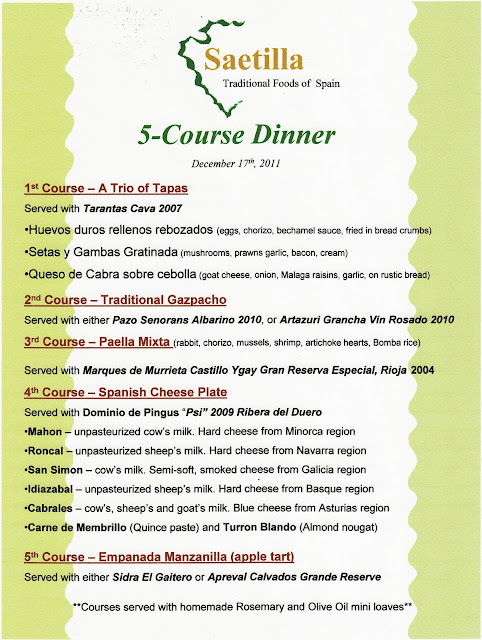 From those wines, we chose the menu items that we felt would work best, and each guest was given a traditional Spanish recipe to make, then bring it on the chosen night, along with their receipts, so the price of the meal would be shared among the different couples. The dinner was for eight people, but as usual, we had enough food to feed twice as many people. The courses we had, all worked great with the wine. Our Cava choice, for the first course, paired well with all three items, but I think the consensus was that the goat cheese, with onions raisins and garlic worked the best. For our second course, we had a traditional Gazapacho (cold tomato,cucumber and garlic soup). Originally, I had planned on going with only with an Albarino, but the more I thought about it, I felt a Vin Rosado (rose) from Rioja, might be a better match. I am glad I second guessed myself, and added the Rose. It was an excellent pairing, and one of the surprise wines of the night (and least expensive). Also, the addition of a little Fino Sherry to the Gazapacho was a nice added touch. The main course of the evening was a Paella Mixta. This was my responsibility for the evening. I decided to pair this with a traditional Rioja. While the Castillo Ygay Gran Reserva was already seven years old, I knew it was going to need some air before drinking. I opened up this bottle and decanted it, about three hours before serving. This was the favorite wine of the night. Smooth, silky, not too tannic, and worked well with all the flavors of our Paella. Even the seafood element (which I typically don't pair with reds) worked nicely. The authentic Spanish Bittersweet Paprika added a nice smokiness to the dish. I have added my recipe to the comments section below. Following the European tradition of transitioning from main course to dessert course, we had a cheese plate. Originally, I had only planned on three cheeses, but, since I love cheese, I went overboard, and presented five cheeses along with Quince paste, and almond nougat. To this, I paired a 2009 Ribera del Duero. This was a powerful wine, and I decanted it in my largest decanter, getting as much air in as possible. I opened this five hours before, and I probably could have opened it up a full day before. I thought all the cheeses paired well with this fine Tempranillo, but I would stay away from the Cabrales next time, as I felt it was too strong (even when eaten with the quince paste, which mellowed it a bit). If I were to choose a blue cheese again, I might go with Valdeon, which is not as over powering. Our final dish was an apple empanada. I paired this with a wonderful Sidra (Spanish apple cider). At only 5% alcohol, it was refreshing, and palate cleansing, with just the right amount of apple flavor to work with the empanada. We also had some Calvados left over (okay, I know it's not Spanish, but we had it, and it's made from apples, so why not?). I've already had requests for my paella recipe. Since it is a "mixta"...it was my creation, and I will do my best to recreate it, and add it to the comments section of this blog. All the other recipes can be found in different Spanish cookbooks. The total cost of our dinner was $78/couple. As I mentioned, we had plenty of leftovers, so this easily could have been a $50/couple dinner, if I had bought more wine, and invited 16 people (We just don't have enough seating for that many...or place settings). So, next time you see a wine pairing dinner, where the cost is $150/couple...just remember you can probably do the same, at a more reasonable cost. And in this economy, who isn't for that? Plus you might have some fun learning how to make traditional regional foods, and cooking techniques. It's that time of year again, and some people either love it or hate it...no, I'm not talking about the holidays or even fruitcake. I'm talking eggnog. I can tell we're in the holiday season as soon as I see the yellow stuff showing up on the grocery store shelves. So what is the history of eggnog, and what do you do with it? I can't shed any new light on the history of eggnog, so here is what I've been able to find out through some research. Eggnog appears to have been developed in Old England. At the time, only the upper class was able to afford dairy products such as eggs and cream. Also remember that sanitation was an issue back in the day, and one way to ensure that bacteria was killed was with the addition of alcohol (at the time, probably Madiera, Brandy, or Sherry were added). As the concoction moved to the new world, the availability of Rum and Whiskey replaced the traditional additives. 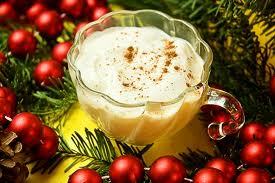 Eggnog is basically a mixture of cream, sugar, raw eggs, and maybe some cinnamon or nutmeg. 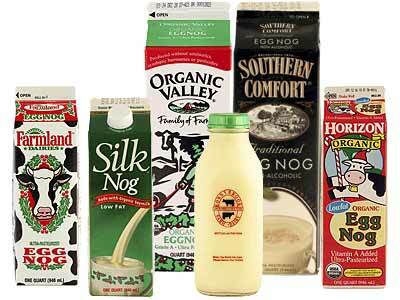 Nowadays, you can get low fat eggnog, soy eggnog, Organic eggnog, and lactose free eggnog. Under current U.S. law, commercial products sold as eggnog are permitted to contain milk, sugar, modified milk ingredients, glucose-fructose, water, carrageenan, guar gum, natural and artificial flavorings, spices (though not necessarily nutmeg or cinnamon), monoglycerides, and colorings. Personally, I've only found one commercially produced eggnog that tastes any good. See my note below. Heck, if you are going to drink eggnog, don't worry about the fat content...just drink the best tasting stuff. There are differing opinions as to the origin of the name for eggnog. 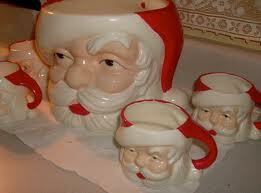 One version says that "nog" derives from an Old English word for strong beer, hence “noggin”. Another version attributes the name to early America where colonists referred to thick drinks as “grog” and eggnog as “egg-and-grog”. Either way, we know it today as Eggnog. 1 tablespoon of fine sugar; dissolved with 1 tablespoon cold water; 1 egg; 1 wine-glass of Cognac brandy; 1/2 wine-glass Santa Cruz rum; 1/3 tumblerful of milk. Fill the tumbler 1/4 full with shaved ice, shake the ingredients until they are thoroughly mixed together, and grate a little nutmeg on top. Every well ordered bar has a tin egg-nogg “shaker”, which is a great aid in mixing this beverage. Now most of you will use your holiday eggnog for toasting to friends and family, or sitting around the fireplace. For me, I use it a little differently. 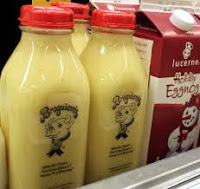 First off, there is only one brand of eggnog that I purchase, and that is from Broguiere's Dairy, here in Southern California. Huell Howser visited their facility a while back, and they were featured on one of his television shows. Huell Howser Video. This is a rich, thick traditional eggnog, with no funky ingredients (you'll know every ingredient on the label). I use this eggnog to make a traditional Christmas Breakfast of French Toast. I take day old French Bread, and dip it in the Broguiere's Eggnog (to which I have added some powered cardamom), then fry in some butter over the stove. This is the best french toast you will ever taste. Add a little Mahogany Smoked Bacon from Meadow Farms Smoked Meats and you have a great breakfast. So, when you are walking through your local dairy section at the grocery store, take a look at the shelf, and see what they have. Read the ingredients, and if it's natural, buy some and try it. If what they carry is full of ingredients you can't pronounce. 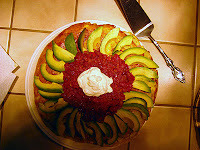 try one of the above recipes, and enjoy the holidays! As we move into the holiday season, I thought it might be appropriate to take a look at dessert wines (not the same as my article on desert wines). When I first started drinking wine, I was immediately attracted to those sweeter style wines. As I tried more and more wine, I found that my palate began to trend towards drier wines. First, the sweet wines disappeared, next the white wines, and all I was left with was red. Now, I have "rediscovered" my love of sweet wines. 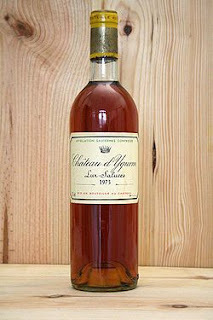 In the United States, a dessert wine is described as any wine over 14% alcohol. Obviously, there are higher alcohol wines (Zinfandel, or most anything out of California) that are dry, and not sweet. This definition is outdated. To me a dessert wine is anything that has a detectable amount of residual sugar. For example, some German wines are only 6% alcohol, but are very sweet. So, for this discussion, dessert wines are any wine that I could serve at the end of a meal, that have some discernible level of sugar. Even though I could serve them at the end of the meal, you may find that they work well before and during a meal too (think Sauternes with foie gras). There are so many different dessert wines out there, how can you tell them apart? What makes them different from each other? And, what are the appropriate foods to pair with them? Let's look at how dessert wines are made first. Grapes are sweet to begin with. Have you ever tasted a wine grape, just off the vine, around harvest time? Extremely sweet. They don't taste anything like those table grapes you nibble on at snack time. Matter of fact, wine grapes are said to have the highest sugar content of any fruit, and that's what makes them so great for wine. You need sugar, to act as food for the yeast, which eventually converts into alcohol. Sweet wines can be made a number of ways. There are fortified dessert wines (such as Port and Madiera), where the grape juice begins to ferment, but is stopped short of full fermentation (where all the sugar is converted to alcohol, and the wine is dry). Fortified refers to the addition of brandy (see my blog on Cognac) into the fermenting grape juice, basically killing the yeast, and stopping any further fermentation. What is left is a sweet juice, fortified with a high alcohol brandy. A second method for producing a sweet wine is through the development of "Noble Rot" on the grapes. 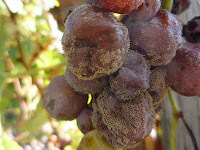 This gray mold is known as Botrytis Cinerea (Latin for "ash grape disease"). The beneficial mold (and there is a bad mold too) infects those grapes that are exposed to wet and dry conditions, usually found around bodies of water. 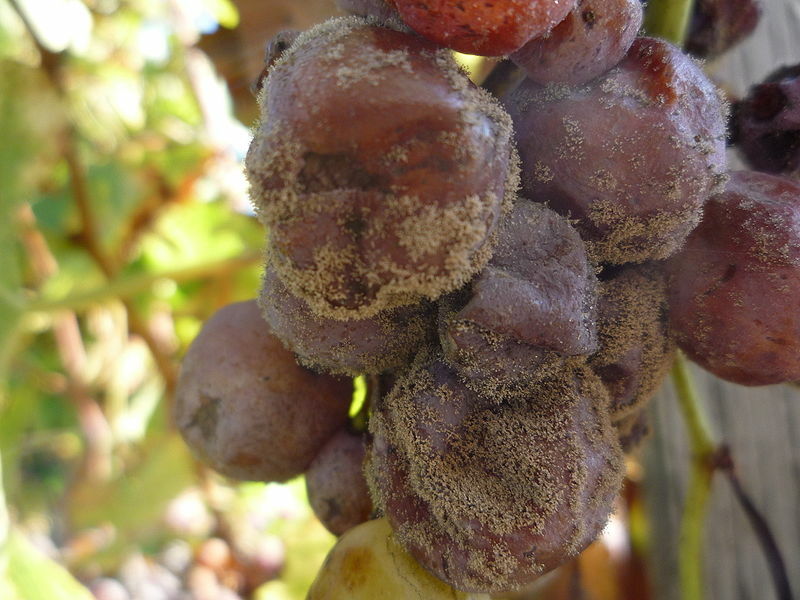 The mold, or fungus infects the grapes, and draws water from them, leaving behind a higher concentration of grape sugars, acids and minerals. When fermented, there is a high amount of residual sugar left in the final product. Some of the best known, and most expensive wines in the world are produced from "Noble Rot" grapes: Sauternes and Tokajii. The fungus does add a unique honeysuckle aroma to the wines. 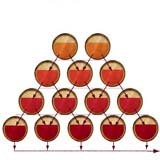 Some other methods of increasing the sugar content prior to fermentation include leaving the grapes on the vine longer than usual ("late harvest" wines), producing higher sugar content. Or, allowing the grapes to freeze on the vine, as winter conditions sets in. In this case, the ice crystals are removed, and you are left with a concentrations of solids. These style of wines are known as "ice wines". Another method is to pick the grapes at the normal harvest time, and dry the grapes. This can be done on straw mats (as is done with Vin Santo in Italy) or in drying rooms. These wines are known as "passito" wines in Italy, or "vin de paille" in France. Again, the idea is to remove the water, and concentrate the remaining solids. The drying method adds a distinct oxidized character to the the final product. A sweet Sherry known as Pedro Ximénez (PX), is a made with a combination of drying, then fortifying. There are some "lesser" methods for producing sweet wines, which include the addition of sugar (known as chaptalization). The sugar can be in any form: honey, beet sugar, or in some cases, a concentration of grape sugars (known as Süssreserve). Sauternes and Tokajii paired with foie gras, blue and hard cheeses. Brechetto d'Acqui - While not traditionally thought of as a dessert wine, I find this sweet, frizzy wine, to be one of the best wines to pair with chocolate. I know others think of Port, but try this one if you can find it. I was talking with a friend today, and he had received his club shipment from Melville Winery Estate. In the shipment were three different bottles of Pinot Noir. Each was made with a different clone. You don't know how tempted I was to name this weeks' blog "Clone Wars", but my better sense helped me to hold back. So what is a clone, and why should it make any difference in the wine you drink? First, the definition of a "clone" is (Hartman, et. al., 1990 from Ed Hellman, Texas A&M): a genetically uniform group of individuals derived originally from a single individual by asexual propagation (cuttings, grafting, etc). What that means in layman terms is that a new plant is created in the exact image (biologically identical) of another superior grape vine, without the use of a seed. The clone is created from clippings (bud or shoot) from the "mother vine". 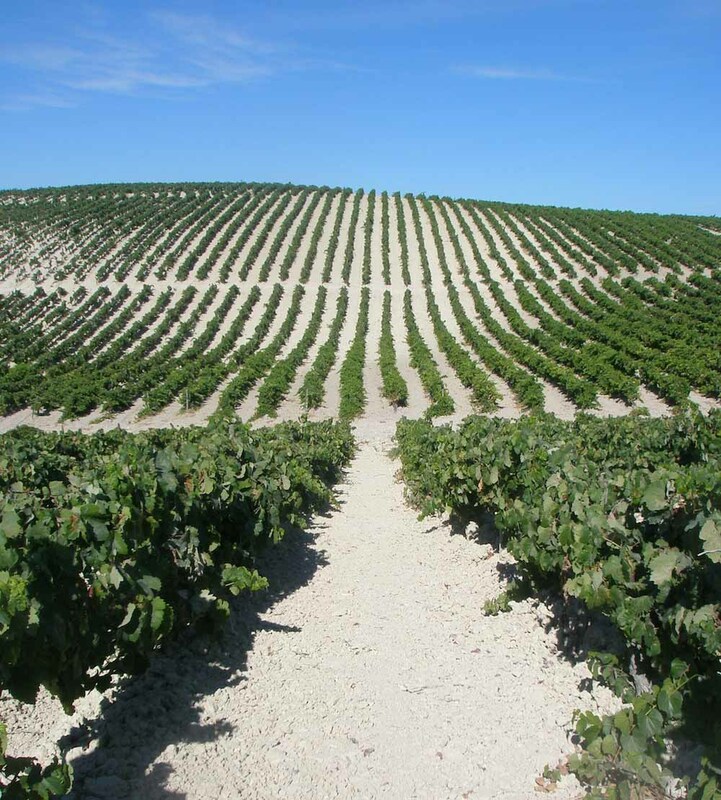 In this way, the grape grower can populate his/her vineyard with those grapevines that produce the best grapes. The superior grapevine will demonstrate attributes and characteristics that the winemaker finds desirable. However, most vineyards will have a mix of different clones, so that the livelihood of the vineyard is not dependent on a single clone. Also the winemaker may blend the different clones to create a more complex quality wine. Some of the characteristics that make clones distinct include berry and cluster size, yield, fruit color, phenolics, flavor and aroma, time of budbreak and amount of time to ripen, vine and canopy vigor, cold/heat hardiness, and disease resistance. Obviously, all of these are critical to grape quality, and the eventual wine produced. When we hear about clones, it is usually in reference to Pinot Noir, but any grape variety can be cloned. 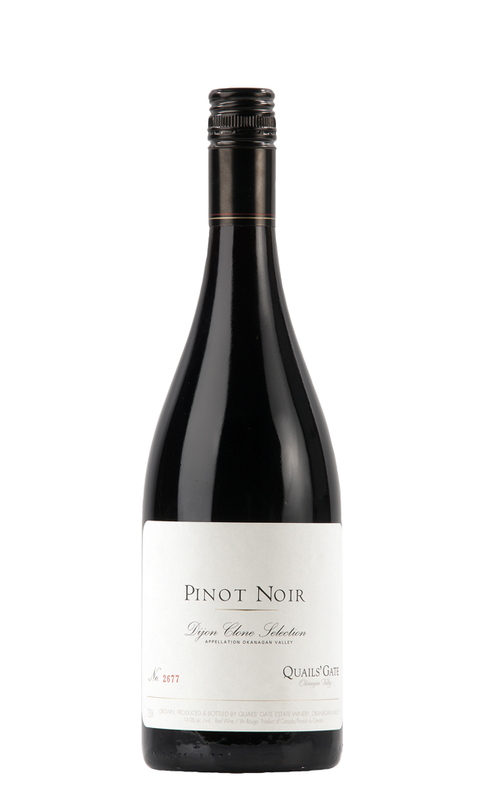 It just happens that Pinot Noir is an old variety, and is very susceptible to mutation. Some of Pinot Noirs' "relatives": Pinot Blanc, Pinot Gris, Pinot Meunier. Each differs from the parent grape. 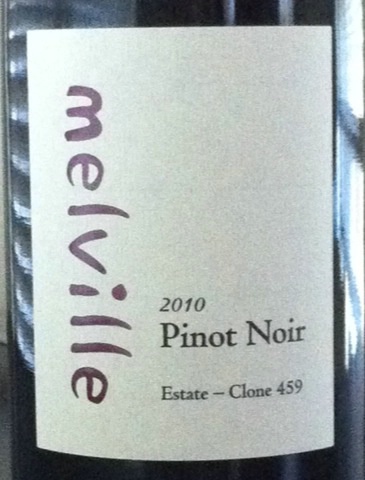 If we just look at Pinot Noir, the French have identified over 1000 different clones of Pinot Noir. California is a perfect example of how clonal selection affects the wine produced. The early history of Pinot Noir in California was the story of smuggled "suitcase" clippings from Burgundy. For example, cuttings taken from Romanée-Conti (considered the world’s most distinguished Pinot Noir vineyard) were planted, and some had outstanding results, while others didn't do so well. After 1987, Dijon clones began to arrive. All of these clones were identified by a French scientist named Raymond Bernard. He identified individual vines that had different characteristics, propagated them, then assigned numbers to each. Now, clonal selections are registered by the University of California Davis (UCD) and certified by ENTAV (Etablissment National Technique pour l’Amélioration de la Viticulture) in southern France. These registered cloned vines are then named or numbered and propagated on site and cuttings made available to nurseries. There are only four nurseries in North America authorized to propagate and sell ENTAV clones. So the next time you try Pinot Noir, Chardonnay, or Sangiovese (the grape varieties you'll most likely encounter clones), keep track of which clones are present. Each will have different expressions of the grape variety. Knowing what you like, may help influence your tasting decisions in the future. Form your own opinions and experiment. Just remember that the clone alone, will not affect the final wine....vineyard site, growing practices, and cellar processes will affect the final product. Where did the year go? It's Thanksgiving already, and time to figure out what wines I want to share at our Thanksgiving dinner. A year ago, I wrote about the difficulty in doing a "perfect pairing" with the dinner. There are so many components, and different family traditions that it would be impossible for me to give you the perfect wine to pair with your meal. This year, I'm going to break my own rules, and actually offer up some wines that I think work with all types of Thanksgiving meals. Remember out basic "rules" for wine pairing: consider the most prominent flavors in your meal; the weight of the meal; and finally, what wines will your guests enjoy. 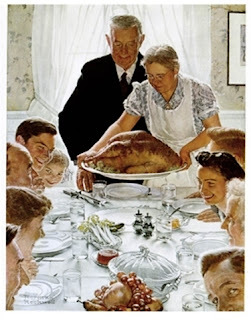 There are a number of white wines that work with Turkey, and all the trimmings. 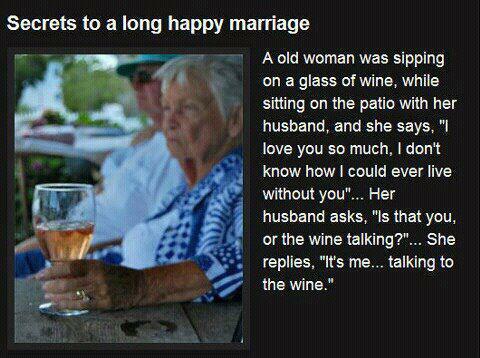 Probably the most common would be Chardonnay. I find that those that are heavy on the oak, detract from the meal, so look for stainless steel fermentation, or lightly oaked. Personally, I like to serve something a little out of the ordinary, rather than Chardonnay. My first choice would be a Sauvignon Blanc or Riesling. On the lighter side, a Pinot Gris (Grigio) might be something to look at. For those that like Chardonnay...try a Viognier instead. If you are really daring, I love Italian Falanghina. All of these are getting easier to find in your local wine shop. Dragonette Cellars Happy Canyon Sauvignon Blanc 2010 (The best Sauvignon Blanc in California). Red wine is a little harder to pair with Turkey, but when you add cranberries, nuts, and sausage stuffing, red might just be the go to wine. Most people might run right to the Merlot (and a fruitier version might work), but I think Pinot Noir would be a better choice, as would Zinfandel. Want to try something different? How about an Italian Barbera, or a French Beaujolais? You do know that the Beaujolais Nouveau came out last week, don't you? I'm not a big fan of the nouveau version, but a Beaujolais Village (Morgon, or Moulin-a-vent) would be a great addition. Of course, if you can't decide between red or white, go with Rose or even a Sparkling wine. I love the roses' that are coming out now. They are dry, and full of fruit (not like your parents' white zinfandel). Sparkling wine doesn't have to be an expensive Champagne...look for a Spanish Cava, or (surprise) a New Mexico sparkler from Gruet (believe me, you'll be surprised). For rose, I love the wines coming out of Southern France. If you can find it, try the Domaine Tempier. If you want to stay state-side, check out Dragonette Cellars Rose of Pinot Noir (stunning), or Foley Rose. I asked my friend, Brandon Sparks-Gillis (winemaker at Dragonette Cellars) what wines he would serve. Here is his response, "I love Rose w/ Thanksgiving because it works so well w/ anything on the table. Happy Canyon Sauvignon Blanc ('09 or '10) has the body to pair remarkably well w/ turkey, and pretty much everything else. Our Pinots...ditto...I'd go for the 08's if you have any, or decant the 09 Fiddlestix for an hour or so. The surprise might be the 09 Grenache. It's got earth and spice that complement the fall flavors, and it's killer w/ cranberries and pumpkin pie. Have a great Thanksgiving, and let us know what pairings you find!" I hope that whatever wine you choose, you don't fret over it. It is more important to share time with your family and friends, than to worry about the wine. Have some fun. Experiment. Try something new, and share your best pairings, by adding your comments below. I am thankful for those of you who have been following this blog, and sharing it with your friends. I am thankful for those that keep voting for my blog (see the vote here link at the upper right of the page),,,you have moved my blog into the top 130 wine blogs in the country. Keep it going, and have a Happy Thanksgiving! With apologies to U-2, I had to title this weeks blog this way. It all started with weekend trips to Del Mar, to stay at a friend’s condo on the beach. We now have a Sunday ritual. We would walk down Highway 101, into the town of Solana Beach, and stop in for breakfast at T’s Café, but no breakfast was complete without one of their Bloody Marys. So on those weekends that we were not down in Del Mar (most weekends) we started walking around different areas of Lake Arrowhead, then returned to the alternating hosts’ house for breakfast and Bloody Marys. So what is the history of the Bloody Mary? It all started when Louis Perrin first served tomato juice as a beverage around 1917 (apparently he ran out of orange juice and needed a substitute). Tomato juice was considered a hangover cure in the early part of the 20th century. 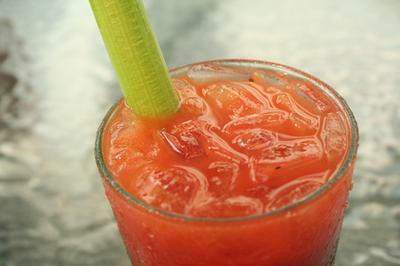 You drank tomato juice when you had a hangover, and it was good for you. This was right at the beginning of canned tomato juice (do I sense some marketing scheme?). Seems that works well on a Sunday morning, after a Saturday night of wine tasting (or drinking). 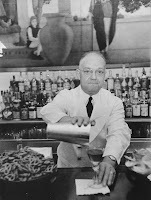 The story goes that Fernand "Pete" Petiot, a French bartender at Harry's New York Bar in Paris (Harry’s New York Bar, originally was located in New York City then dismantled and rebuilt in Paris in 1911), invented the Bloody Mary in 1921 by mixing equal parts tomato juice and vodka. According to the legend, one of the bar's patrons came up with the name after noting that the drink reminded him of the Bucket of Blood Club in Chicago, and a girl there named Mary. After Prohibition, the drink travelled to Manhattan, along with Petiot, who got a job at the King Cole Bar at the St. Regis Hotel. Another story claims that actor George Jessel invented the drink around 1939, which is when Lucius Beebe first made reference to it in his popular gossip column "This New York" - the earliest known mention of the drink by that name in the United States. This account is further confused by reports that Fernand Petiot reinvented the Bloody Mary as the "Red Snapper" at the St. Regis Hotel in 1934. According to mixology lore, in 1934 the Russian Prince, Serge Obolensky, ordered a Bloody Mary at the King Cole Bar but requested that bartender, Fernand Petiot, spice up the drink a little. Petiot named the new creation a “Red Snapper”. The drink’s previous name, Bloody Mary, was dropped because it was deemed too vulgar for a bar located in one of the City’s most elegant hotels. 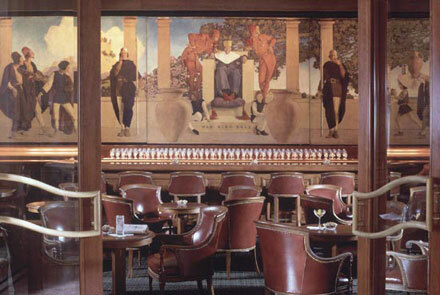 This change never really took hold and even the King Cole Bar reverted back to using the drink’s original name. Petiot’s original “reinvented” recipe: “Cover the bottom of the shaker with four large dashes of salt, two dashes of black pepper, two dashes of cayenne pepper, and a layer of Worcestershire sauce; then add a dash of lemon juice and some cracked ice, put in two ounces of vodka and two ounces of thick tomato juice, shake, strain, and pour”. · 1 ½ to 2 oz vodka in a highball glass filled with ice. A Bloody Mary is the perfect drink for a Sunday brunch, and it works great with certain breakfast dishes. A couple weeks ago, I decided to go Spanish with the breakfast, and made a Tortilla Espanola served with sofrito, avocado and sour cream. 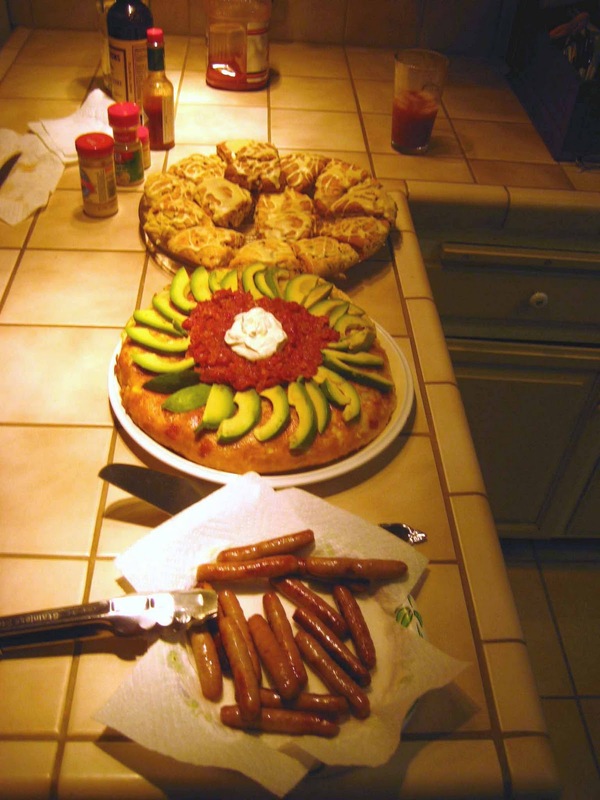 Add to that, some breakfast sausage, and homemade scones, and you’ve got a meal that goes with Bloody Marys. Put potatoes and onions into a bowl and mix them together. Salt the mixture. In a large, heavy, deep stock pot, heat the peanut oil on medium high heat. Carefully place the potato and onion mixture into the pot. The oil should almost cover the potatoes. You may need to turn down the heat slightly, so the potatoes do not burn – you are not making potato chips. Leave in pot until the potatoes are cooked. If you can poke a piece of potato with a spatula and it easily breaks in two, your potatoes are done. Remove from the pan with a slotted spoon and allow oil to drain. After cooling, you can put in a container in the refrigerator, then bring back to room temperature for easy assembly in the morning. Crack the eggs into a large mixing bowl and beat. Pour in the potato onion mixture, and add ham. Mix together until everything is covered with egg. Pour 2 Tbsp of olive oil into a 12" non-stick frying pan and heat on medium heat. Be careful not to get the pan too hot. When hot, pour the mixture into the pan and spread out evenly. Allow the egg to cook around the edges. Then carefully lift up one side of the omelet to check if the egg has slightly browned. The inside of the mixture will not be completely cooked and the egg will still be runny. When the mixture has browned on the bottom, you are ready to turn it over to cook the other side. Place a large dinner plate (at least 12”) upside down over the frying pan, quickly turn the frying pan over and the omelet will “fall” onto the plate. Place the frying pan back on the range and put just enough oil to cover the bottom and sides of the pan. Now slide the omelet into the frying pan. Use the spatula to reshape the sides of the omelet. Let the omelet cook for 3-4 minutes. Turn the heat off and let the tortilla sit in the pan for 2 minutes. Slide the omelet onto a plate to serve with Sofrito. To make the Sofrito, cook the onion in olive oil until translucent, then add the garlic and cook until soft. Add the bell pepper, and cook long and slow until the mixture almost turns to a mush, add the tomatoes and cook until all the liquid evaporates. This entire process is low and slow, and can cook for about 2 hours total (so you may want to make this ahead of time and just reheat for breakfast). We're always looking for new breakfast ideas, so if you have a favorite recipe, please feel free to share it here. A year ago, I wrote my first wine blog. A number of friends had encouraged me to share my thoughts on wine, beer and spirits. I had just finished reading Gary Vaynerchuk's book, "Crush It". The book dealt with finding your passion and following that passion. Much of the book talked about how to take advantage of the internet. At that time, I had heard about a website called Quora.com, and joined that site. I have since become one of the "answer people" for wine related questions on that website. Some of my blog ideas come from the questions that others have posed, and many of my subjects come from you the readers, as well as members of my wine club. Over the last year, I've written on numerous subjects. We've explored the techniques for evaluating a wine, and looked at the lowly Agave plant and the wonderful Tequila it produces. What I find interesting is who is reading this blog. Behind the scenes, there is a stats page, that I can evaluate the website. As expected, the majority of readers are from the United States, coming in at 65%. I'm actually surprised it is that low. Germany, The United Kingdom, Canada, France, Russia and Australia make up another 15% of the readers. I've seen the readership grow by ten times over the last year, and it seems the most read article was the one about wine bottles. It goes to show that you never know what people will want to read about. I didn't think the article would be of too much interest, but wrote it after getting some questions about why wine bottles are a certain color. The second most popular article wasn't much of a surprise: wine stoppers. 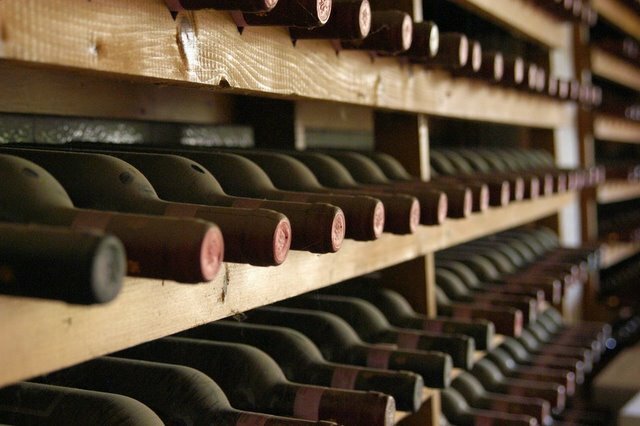 There is an ongoing argument about whether cork or screwcap is the way to go. I thought this might spark some conversation. Matter of fact, this article had the second most comments posted. The article with the most comments was my blog about wine pairing. I still find this a challenging subject, as taste and pairing are somewhat subjective. I do feel that the guidelines I outlined lay a good groundwork for helping the everyday wine drinker feel more comfortable about their choices. So, where do we go from here? I am always looking for ideas to share and answer. I continue to learn. My latest reading involves Biodynamic, organic and natural wines. When I visit with winemakers and growers, my questions now lean towards how they treat the grapes in the vineyard and the winery. Can we, as wine lovers, really taste the difference? I think so. I am expanding my knowledge base, and hope to share some other experiences with you. My restaurant background is limited. I have always been more involved in the education side of being a Sommelier, rather than the service side. That being said, I enjoy cooking, and pairing wines. Or, should I say, drinking wines, and making the foods that I think will go best with them. Spanish, French and Italian cuisine have been a focus of late. Learning their cooking techniques and use of ingredients has been eye-opening, and I hope to share some of these "discoveries" over the coming months. For those of you on Facebook, please join my page there: www.Facebook.com/SommelierUpdate. On the Facebook page, I share daily articles pulled from the news pages, that concern wine and the wine industry. I hope you have enjoyed the articles over the last year, and will continue to visit this site, and share your comments, and questions. Additionally, I hope you will share this site with your friends, and we will grow together in our wine knowledge, and experiences. The one thing about wine, beer and spirits...they are changing all the time. New technologies, new ideas, and new vintages. Thank you for the past year, and I look forward to sharing with you for another year to come, and don't forget to vote for this site on LocalWineEvents.com, by going to http://www.localwineevents.com/resources/blogs/view/1494/the-sommelier-update, and clicking on the "Vote for this Blog" button. You have probably heard that a glass or two of wine a day might actually be good for your health. 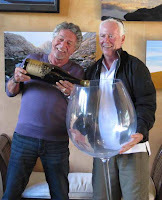 There has been a funny photo circulating the internet of a person with a huge glass, with the caption, “one glass of wine a day – doctors’ orders”. It got me thinking about how the wine glass you use affects the wine. A couple years ago, I attended a Riedel tasting. I was a skeptic about a wine glass making any kind of difference in the enjoyment of wine. The first thing I learned was the Riedel is pronounced like it rhymes with “needle, not ‘Rid-el”, as I had always said it. Let’s look at the basics of a wine glass. It is usually made up of three parts: the bowl, the stem, and the foot. The highest quality wine glasses are made of lead crystal. Why leaded crystal? It’s claimed that lead crystal has a higher light refraction index, allowing for better observation of the wine in your glass. Secondly, leaded crystal (on a microscopic level) has a rougher surface area, allowing the wine to open up more when swirled, creating a better environment for evaluating the aromas of the wine. 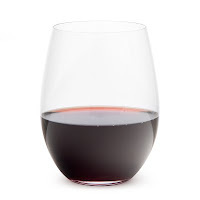 According to the Riedel representative, conducting the tasting, the selection of the wine glass for a wine style is important, as the glass shape can influence its’ perception. The wine glass affects the interaction of the wine with air. Taste is largely impacted by the smell of the wine. So, the glass should affect flavor. For example, the wider the bowl, the more "breathing" the wine might experience. This is why red wine glasses are bigger than white wine glasses. The larger bowl lets you aerate red wine more, softening the tannins. The shape and size of the rim of the glass also plays an important role in the ultimate wine experience. According to the Riedel people, the rim helps determine where the wine is directed into your mouth. For example, some shapes direct the wine flow to the center of the tongue, while others focus on the tip of the tongue. Each spot of your tongue is thought to sense certain flavors differently (see my blog on taste). Through trial and error, the makers of fine glassware were able to direct the wine flow to help accentuate the key components of the wine. Another consideration is having a stem on the glass or not. This allows you hold the glass without affecting the serving temperature of the wine. It also lets you see the color of the wine without your hand getting in the way. The newest trend seems to be stemless glassware (mainly because if anything is going to break…it’s going to be the stem). I still have trouble with these. I like to swirl and observe the wine in the glass, and find these difficult to work with. When it comes to breaking the stems…the best advice I heard was, “don’t drink and dry”. Most wine glasses are broken while cleaning and drying the glass. I always put a little water in the glass (to avoid a wine stain), then clean them in the morning. Speaking of cleaning – never use soap on your wine glasses (particularly champagne flutes). The soap residue will affect the flavor of your wine, and, in the case of sparkling wines, creates a film on the glass, that smoothes out the surface of the glass. Remember those microscopic rough surfaces, created by leaded crystal? They help release the carbon dioxide gas trapped inside the sparkling wine. Soap film will dramatically reduce this affect. So, always just wash with very warm water, and allow to dry. If there are stubborn lipstick stains, you can always steam the area in front of a tea pot, or boiling water. If placed on a shelf, the glasses should be stored with the bowl facing up. Yes, they might collect dust (unless you are like me, and use your glasses quite often). If they are stored rim side down, they can absorb the aromas in your shelf. I said I was skeptical in the beginning. No longer. I am a firm believer in the affects your stemware has on the ultimate wine experience. If you have not been to a Riedel tasting, I encourage you to try it. Here it is, the end of October, and what are people thinking about? Grape Harvest? The end of daylight savings? No...Halloween. And what goes along with Halloween? Spirits. 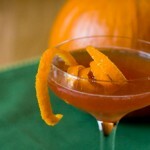 Not those ghostly type, but the drinks made with spirits for the Halloween party. So what exactly are spirits, and what differentiates them from wine, beer, or liqueurs? The word "spirit" comes from the Latin "spiritus", or breath. While this is usually associated with the soul, or ghostly images, it can also refer to a type of alcohol. In this context, "spirit" comes from Middle Eastern alchemists, who were working with medicinal elixirs. (Most alchemist of the time were trying to turn lead into gold.) The vapors given off during an distillation process were known as a spirit of the original liquor. And where did the word "liquor" come from? It is from the Latin verb "liquere" which means "to be fluid" or liquid. Spirits are drinks that have had the alcohol concentrated by the process of distillation. The final product, after the distillation process, will create a product with about 37% to 43% alcohol (with a minimum of about 20%). Remember that beer is around 3% to 8% and wine is in the range of 7% to 16%. Anything that can be fermented, can be made into a spirit. All that is required is sugar, or starch that can be converted into sugar. So raw materials such as fruit, vegetables and grains, are fair game. 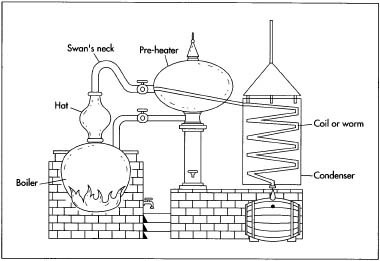 The process of distillation is actually very simple. In general terms, the fermented liquid is cooked in a pot. As the liquid is heated, it vaporizes and rises from the pot into a condensation coil, where the vapor is cooled, and returns to liquid form. Ethanol vaporizes at a lower temperature than water, so this process creates a new liquid that has a higher concentration of alcohol than the original. This new liquid is separated into "heads and tails" (the first and last cuts of the vaporization process) and removed. They are removed, because these first and last contain possible toxic components. Only the "heart", or middle is used. Again, this is a very simple explanation, as there are many types of distillation techniques that are used, and they all produce different results in the final product. Spirits made from wine (made from grapes) is known as Brandy (see my article on Cognac). Spirits like Vodka can be made from a number of different materials: potatoes, grain, or even sugar cane, while others, like Tequila can only be made from the Agave plant (see my article on tequila). The most common spirits are: Brandy, Gin, Rum, Whiskey, Vodka, and Tequila. Liqueurs (or cordials) are spirits that have added flavor or sweeteners. These additions were originally included for medicinal purposes (usually digestive aids, or herbal cures), where the alcohol helped to accelerate the absorption. Most liqueurs are based on secret recipes, with a mix of herbs, bark, roots, seeds, fruit, etc. Some of the best known liqueurs are: Bailey's Irish Cream, Grand Marnier, Kahlua, Sambuca, Frangelico, and Schnapps. For those of you who still insist on wine at your Halloween party, why not try some Orange Wine? Basically, just white wines with some longer skin contact. Or, you could buy any number of wines with spooky themes: Vampire Vineyards, Hocus Pocus Syrah, Skeleton Wine, Witch Creek Winery, or even Big Red Monster Wine. Whatever you decide to do with your Halloween party, have fun, and enjoy! Last week, our wine club held a Spanish tasting. In addition to the wines of Rias Baixas, Ribera del Duero, Rioja, La Mancha and Priorat, we began and ended the night with the wines of Jerez. Not familiar with those? I bet you've heard of Sherry. There was a common reaction when I started the evening with a bottle of Manzanilla Sherry..."I don't care for Sherry, it's too sweet". It was my mission to re-introduce the tasters to the world of Sherry. 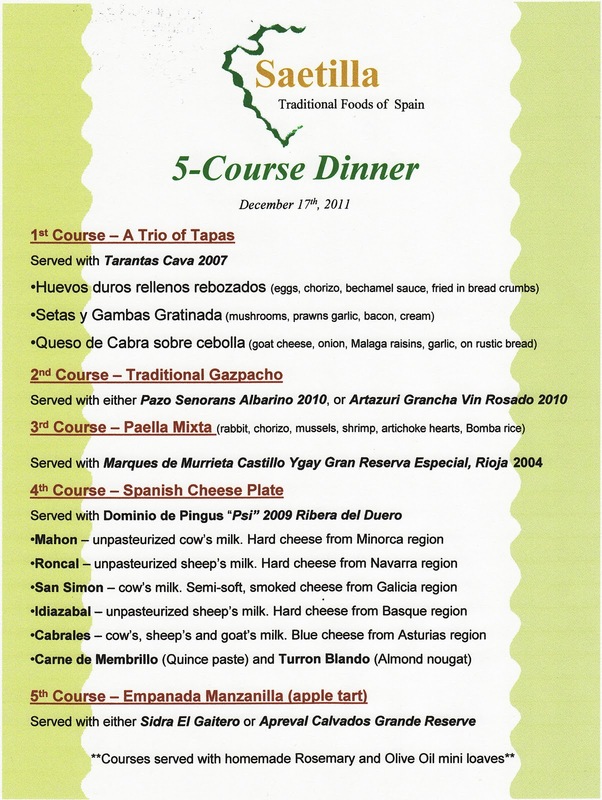 The tasting consisted of a small pour of Manzanilla, paired with their choice of: Cabrales Cheese, Marcona Almonds, Manzanilla Olives, and/or Serrano Ham. I ended the evening with a pour of PX Sherry, served over a scoop of vanilla ice cream (yes, this one was sweet). I gave a brief talk about Sherry, but thought this might be a good vehicle to expand on it a little more. Sherry is a protected/registered name for the fortified wines produced in the Cadiz region of Southern Spain. 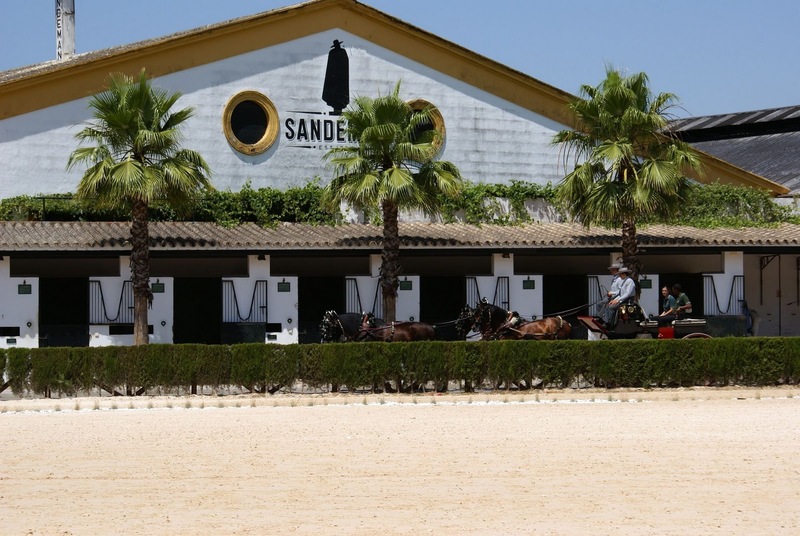 The growing area is a triangle bordered by Jerez, Sanlucar de Barrameda, and El Porto de Santa Maria. This is a hot, dry region, nestled right up against the Mediterranean Sea. This area is known for it's chalky white soil, known as "Albariza". By law, 40% of the bottled Sherry must come from grapes grown in this soil. The unique feature of this soil is it's high content of chalk (which can absorb the limited rainfall, and retain it during the summer months), and the ability to reflect the sun back up to the grapevines, for improved photosynthesis. All three grapes grown on the region for Sherry are white grapes. They are Palomino, Pedro Ximenez (PX) and Moscatel. Palomino is the main grape used in all dry Sherry. 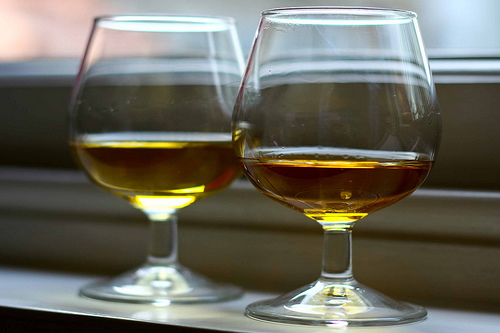 PX and (to a lesser extent) Moscatel, are used to make sweet Sherry, or used to sweeten dry Sherry. 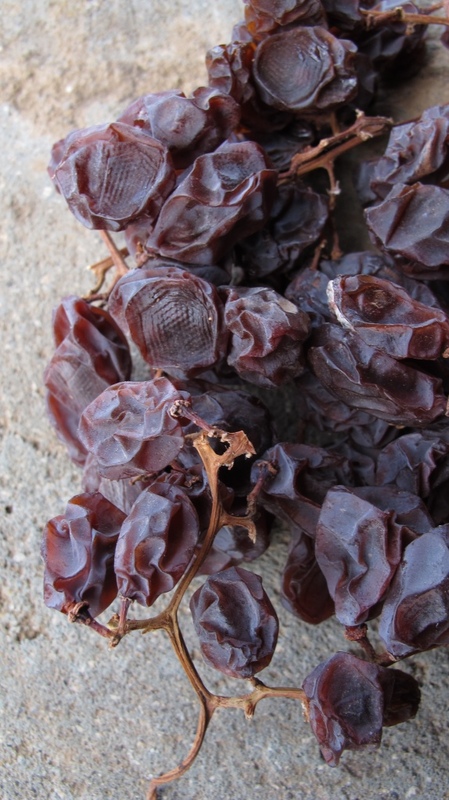 By itself, the Palomino grape produces a rather neutral and bland wine, but this is the perfect type of grape for the process of making Sherry, as the processes used will determine the final product. As mentioned, Sherry is a fortified wine, meaning that a distilled wine (brandy) is added to the still wine at some point in the process. In the case of Sherry, the juice is fermented to dryness, and the brandy is then added (unlike Port, where the brandy is added before fermentation is completed, to preserve the residual sugars). Here is a little trivia for you...traditionally, the grapes for Sherry, were foot trodden (not done much any more), after adding a small amount of gypsum (to adjust for the low acidity). This was known as "plastering". So if you ever get "plastered" you now know where that saying came from. Back to the vinification process...Before the brandy is added to the still wine, the winemaker will sample the wine, and make a determination of its' future. A mixture of brandy and wine (known as "mitad y mitad") is added to the now fermented wine, and the total alcohol level is brought up to 15% (to allow the growth of "flor") or to 17.5% (to prohibit the growth of "flor"). Flor is a naturally occurring film of yeast that grows on the surface of the wine. This film serves to protect the wine from oxygen exposure. The flor contributes to the nutty, yeasty flavors of the final product. Sherry is a "fractionally blended" wine. What this means is that the bottle of Sherry you purchase, can be a blend of many vintages of wine. Picture a bunch of wine barrels (typically American Oak is used for Sherry), stacked on top of each other. The top barrels contain the newest vintage of wine, the row below it is a year older, and so on, all the way to the bottom row of barrels, which contain the oldest wine. 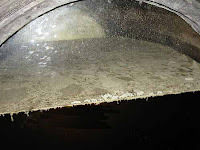 As wine is drawn off the bottom barrel, a little from the barrel above is added in, and the then the barrel above that one is added in, all the way back up to the top barrel. This system is known as a "solera" system. By using this process, there is a consistent style produced by the winemaker, year in and year out. Every bottle can, and will, contain some portion of wine going back to the beginning of the solera. Fino is the lightest, and most delicate of the traditional varieties of sherry. The wine is aged in barrels under a cap of flor.This should be drunk young, and pairs best with almonds, fried food, green olives, seafood and tapas (think shrimp and calamari). Amontillado is a variety of Sherry that is first aged under flor but which is later exposed to oxygen, producing a sherry that is darker than a fino but lighter than an oloroso. Naturally dry, they are sometimes sold light to medium sweet.Best paired with almonds, Manchego Cheese, nuts, richer tapas dishes, and beef stock based soups. Oloroso is a variety of Sherry, aged in the presence of oxygen, for a longer time than a fino or amontillado, producing a darker and richer wine. These are the highest alcohol Sherries, around 18 to 20%. They are naturally dry, but can also be sold in sweetened versions.Best paired with blue cheese, and hard cheeses (something with a bit of salt to it), as well as nuts, and beef dishes (with the drier styles). Jerez Dulce (Sweet Sherries) are made either by fermenting dried PX or Moscatel grapes, producing an intensely sweet dark brown wine, or by blending sweeter wines with a drier variety. 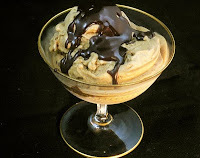 I like PX sherry with dark chocolate desserts, or over vanilla ice cream. 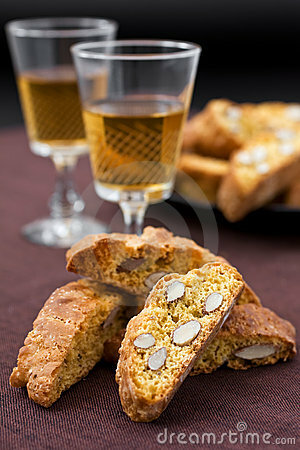 Cream Sherry is a common type of sweet sherry made by blending different wines, such as oloroso sweetened with PX. Have you ever noticed that both Sherry and Port, have English names on the label? If you go back in history, you find that the English dominated the shipping lanes, and imported wines from all over the world. Cadiz was the site of a famous incident involving Sir Francis Drake. After he had sacked the port, and returned to England with a ship full of Sherry, England's thirst for the wine grew. many English families moved to Spain and took over the wine cellars in the region. Think: Sandeman and Harvey's. Cream Sherry used to be one of the most popular beverages in the United States, particularly in the South and East. So, are you ready to venture into the world of Sherry? Next time your order that big plate of seafood paella, consider a glass of Sherry, and let the magic begin.